Voting on Marriage: What If I’m Not Traditional? Minnesota is in the midst of a political battle over marriage. In less than a month we’ll vote on a constitutional amendment that would define marriage as between one man and one woman, disallowing gay marriage (which is already what Minnesota law says). I’ve dreaded the debate this amendment would bring. And I’m reluctant to talk about it. It’s very polarizing and a good way to lose some work (I’ve been blacklisted for far less). It’s also a good way to lose some friends. I was more vocal than I should have been in the 2008 election and said some things I regret. Since then political discussions on Facebook often make me cringe (if not shudder). Sometimes I wonder who these people are that I once called friends. I don’t want to come off that way. Hopefully I don’t. If I do, I hope you’ll forgive me and we can talk about it instead of my words making you mad or scaring you away. What I found makes me very uncomfortable. There’s no mention of homosexuality or gay marriage at all. Instead they’re advocating for traditional marriage (the typical “we’re not anti-gay, we’re pro-marriage” line). What makes me so uncomfortable is that argument leaves no room for, well, life. I think traditional marriage is great. But it rarely happens. I think kids should have parents—plural. But that doesn’t always happen. 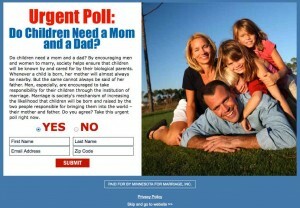 I think dads should be involved in their kids’ lives, but to say that marriage is what keeps a father “nearby”? That’s kind of, well, icky. I think what I find so difficult here is that there’s no attempt made, no caveats, no nod toward life happening. Divorce happens. Death happens. Adoption happens. We’ve got single parents, divorced parents, re-married parents, step parents and adoptive parents. 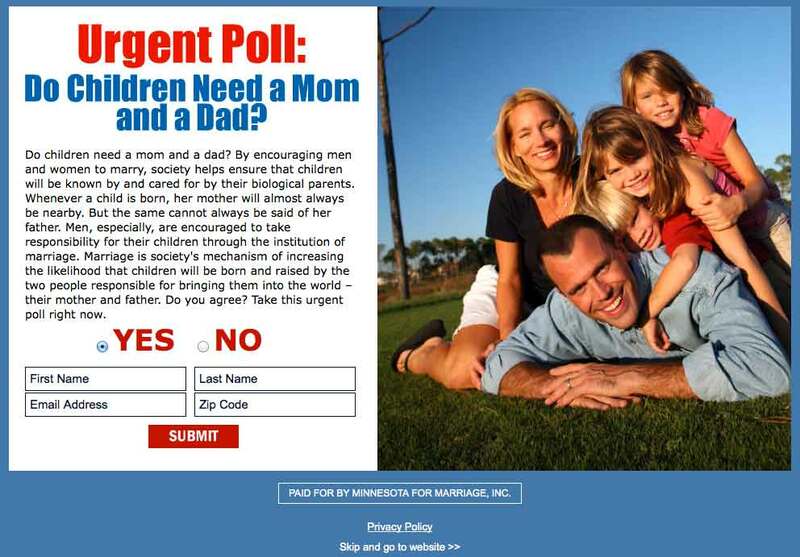 None of them fit very well in this view of traditional marriage as presented by this ad. Using the word “biological” as a norm is unsettling when you have kids who aren’t biological. Let’s face it: A lot of families out there are weird. They don’t look very traditional. I think that’s OK. But it’s important that we include these different situations. Inclusiveness is important. It’s harmful to kids to hold up this traditional model as the only way to go and not acknowledge that there are other families who look different, even weird, but that they’re still OK. They’re not defective or somehow less of a family. To do otherwise communicates to an already confused kid that their family is defective, and by extension, they are. This is the crux of diversity training and a driving force in Sesame Street for the last, I don’t know, 40 years. Maybe what I’m dealing with here is a communication issue. Nothing more. The text is pulled from this page on the campaign site, which gives a little more context. I hope that’s the case. I hope they’re not being intentionally exclusive. But that’s hard to believe. You don’t spend millions on advertising without being intentional. Especially when you could make the same point with inclusive language. It’s probably not hard to guess that I’m opposed to the amendment. I guess I could just ignore the messaging of the “other side,” but I guess being a writer I’m curious about why they’re communicating this way.